Yamaha knew they had an amazing platform for customization when they released the FZ-07. Under that Transformer looking body work, it’s basically identical to the Ducati Scrambler but just with slightly lower bars. If this concept is a hint at what’s to come with the platform, the future just got a whole lot brighter. “When the FZ-07 was first introduced, we knew that the bike’s ‘Crossplane Concept’ parallel- twin engine had outstanding low- to mid-range torque, which is ideal for flat track racing. Babe Demay’s FZ-07 flat track creation has already shown huge potential this season, with Dominic Colindres winning his heat race and also finishing fourth at the most recent AMA Pro Flat Track event. Here in Cypress, we’ve been doing some exploration of our own, and the DT-07 Concept is the result. The FZ-07 is a great bike and also a great platform for customization. 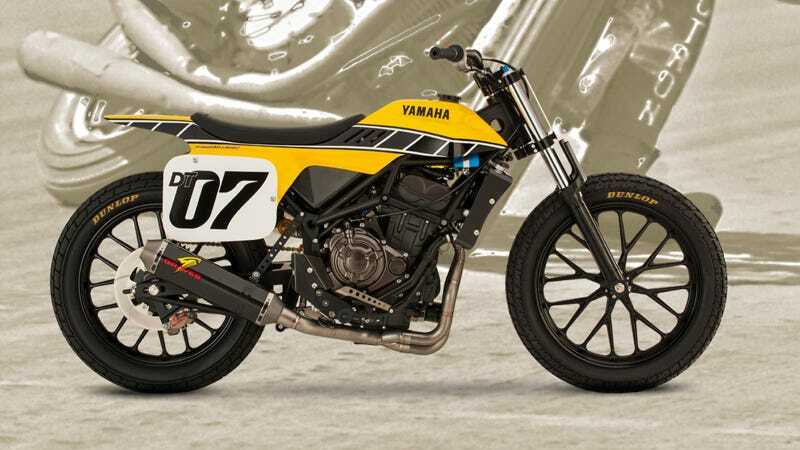 We wanted to see what we could do with the bike as a flat tracker, and we’re very pleased with the results.” - Yamaha Motor Corp’s Motorsports Racing Division Manager, Keith McCarty. Codenamed “DT-07,” the bike is a one-off, designed and built by Jeff Palhegyi Design was unveiled this morning at AIMExpo 2015 in Orlando, Florida. It features a “race-tuned” version of the parallel twin motor found in the FZ-07 and a special exhaust system created by Graves Motorsports. In stock form, the 07 motor makes 75 horsepower and 50 foot-pounds of torque. “One of our specific goals with the DT-07 was to retain some of the FZ-07’s styling cues. I worked with Jeff (Palhegyi) on the design of the bike, and we literally used the FZ-07’s fuel tank cover as the basis for the body mold on the DT-07 Concept. The entire bike was essentially built from scratch, and it is Yamaha’s interpretation of what a dirt tracker designed from the ground up in 2015 should look like.” - Derek Brooks, Motorcycle Product Planning Manager at Yamaha Motorcycle Corporation, U.S.A. The frame was purpose built for this bike, and it also gets a swingarm with an adjustable pivot and link system, an Ohlins rear shock, a modified R6 right side up fork, and wheels by Propulsion Labs. Oh, and let’s not forget that one-piece 60th Anniversary race livery bodywork. “If you petition hard enough, Yamaha will sell you one of these.” - Sean MacDonald, dreamer and maker upper of things he wishes were true. This doesn’t look like it will see production any time soon, and Yamaha is still claiming we won’t get a version of the XSR700 - but I have to think all this flat track and scrambler style goodness and the buzz it continues to create has to be able to sway that. Because we deserve it.